Click here to find a head gasket for your vehicle. Perhaps one of the most important gaskets in your entire engine is that which sits between the cylinder head and engine block. This particular gasket is subject to extreme heat, extreme pressures, and comes into contact with fuel, engine oil, and coolant regularly. As such, the gasket has to be extremely robust to perform in such a demanding environment. On account of this, it goes without saying that you want to make sure that you choose the best cylinder head gasket brand available for your vehicle if you should ever have to replace one. The function of the cylinder head gasket is meant to seal the interface between your motor’s cylinder head and engine block. Head gaskets are typically made using a variety of materials including steel, copper, and a variety of elastomeric compounds. This allows them to withstand the harsh environment within which they live. Cylinder head gaskets have bore holes through which your pistons pass, holes that mate with your coolant jackets through which your coolant flows, and holes that align with your engine’s oil pathways through which oil passes. The thickness of a cylinder gasket is an important feature. If you are replacing your head gasket with an OEM part, there isn’t much to worry about from a sizing perspective because it will be built to the correct factory dimensions. However, in certain high performance applications, the head gasket thickness can be used to make slight alterations to cylinder compression ratios. Overheating – The engine in your vehicle can overheat if the head gasket has failed between a cylinder and a coolant jacket, which causes coolant to leak into your cylinders over time. Less commonly, a head gasket can fail between a coolant jacket and the outside of the engine, which would be noticeable upon inspection as you’d see coolant leaking down the side of your engine block. The loss of coolant can lead to overheating, as your car’s ability to cool itself is compromised. Losing Oil – Similar to the above failure mode, the cylinder head gasket can also fail at one of the oil passageways. This can allow oil to leak into your cylinders, outside your engine, or into your coolant. Low oil absent visible leaks is a telltale sign that your head gasket may be toast. Oil Mixed With Coolant – If your engine oil or coolant looks milky or frothy, this is almost certainly an indicator that coolant is mixing with the oil. The most common culprit for this phenomenon is a head gasket failure between an oil passageway and a coolant jacket. This can compromise both the car’s ability to lubricate the internal engine components as well as cool the engine. Compression Loss – When the gasket fails between cylinders, you’ll experience rough running and a loss of power. This is because your pressure in both cylinders affected by the failure can bleed into one another during each piston’s compression cycle. Engine compression can easily be verified using a compression tester. White Exhaust Smoke – If coolant is leaked into the cylinder when the engine is running, it will be burned as part of the combustion process. Combusted coolant will exit the exhaust as white smoke. Depending on the size of the leak, the smoke can appear insignificant or can be thick and billowy. The denser the white cloud is, the worse the problem may be. It’s important to note that when a motor is cold, water vapor may exit the exhaust pipe and look like white smoke. Typically water vapor dissipates by the time the car is warm which is a way to help ensure you don’t confuse water vapor with coolant vapor. Blue Exhaust Smoke – Similar to the above, if a cylinder head gasket failure allows a significant amount of oil into the combustion chamber, this can present as blue smoke exiting your exhaust pipe. With modern synthetic oils that find leaks more readily than older conventional oils, even a small leak into one of the engine’s combustion chambers (aka cylinders) can be very visible. The denser the smoke, the larger the leak. We should note that a rich fuel mixture can cause black sooty smoke which can be sometimes mistaken for a failed head gasket so it’s important to rule this out first. The head gasket is one of the more difficult components to change on a motor as it requires a fair bit of tear down. Before starting this project, we suggest familiarizing yourself with the procedure to make sure you are up to the task. It requires some patience and attention to detail. First, before you start, it’s important to make certain that you actually have a failed head gasket. There are a few tests that can help confirm this. One simple way to verify a bad head gasket is to test for carbon dioxide in the cooling system. With this test, the coolant is checked for remnants of the combustion process. Another way is by using a compression tester to run a compression test. A low compression reading on one or more cylinders can indicate a failed head gasket (although this can also indicate other issues not related to the head gasket). Step 1 – If you don’t have a service manual for your specific make and model (such as a Chilton or Haynes repair manual), this would be a great time to get one. The procedure is complex and requires a mechanic to be diligent about organization. You will be thankful to have a manual to serve as a guide to make sure you don’t omit any important steps. Step 2 – Drain the engine oil and coolant from the engine and cooling system. For this you’ll want an oil drain pan to catch the fluids. Once the fluids are drained, you need to disassemble the engine down to the cylinder head. This will involve removing the air filter and filter housing, intake tubing, the intake manifold, fuel system components such as fuel injectors, and serpentine belt. You will at minimum need a screwdriver set and a basic socket set with ratchet to remove everything. The fuel components may require use of special tools to remove fuel injectors or fuel lines if your vehicle is fuel injected (use caution as these components are often under high pressure). If any of these components need replacement, now would be a good time so you don’t have to repeat the work in the future. Step 3 – In order to remove the timing chain or belt from some engines, you may need to remove the front engine cover which may also require you to remove your water pump and other nearby components. Again you’ll use the socket and ratchet set. Be sure to take a reference picture or make a diagram of how the chain or belt and sprockets are aligned. It is also wise to mark the timing chain and sprockets to make sure your timing is correct when you put everything back together. Step 4 – The cylinder head will be held on with a number of bolts or studs that go through the cylinder head and thread into the engine block. Check your service manual to know if they should be removed in a certain sequence to avoid warping your cylinder head (a very costly mistake! ), or if they can be taken out as you see fit. Also check whether the bolts can be reused. Some vehicles use a torque to yield bolt that should only be used once in which case they will need to be replaced. If you need replacement cylinder head bolts, we recommend ARP head bolts as we know many people who have had good experiences with them. Step 5 – Remove the cylinder head when all bolts are removed. The cylinder head is heavy and may be difficult to lift by hand. If you drop it, it can be easily damaged. As such, we recommend using an engine hoist to make sure it is secure during removal. Once removed, inspect the cylinder head to figure out the root cause of the failure. It’s also strongly recommended to have an automotive machine shop verify the surface of the cylinder head as well as its general condition. If there is slight warpage resulting from overheating, a machine shop will be able to resurface the head to ensure that it is flat and true. Depending on how much material is removed during this process, you may need a thicker head gasket to compensate depending on your motor. For anything beyond extremely mild cylinder head warpage, you may also want to have your engine block inspected and decked as necessary if warpage is detected. Your machine shop can advise you if they think this is necessary. Step 6 – Clean the surface of the cylinder head and engine block. Do not scratch the surface on either, which can prevent the gasket from sealing properly. You can accomplish this using a gasket scraper. You may want to clean the bolt holes in the engine block also. This may require a tap set or a thread cleaning tool. If chasing the threads, take extreme care not to cause damage to the threads or let any resulting metal debris enter any portion of your engine. Step 7 – Place the head gasket onto the engine block, ensuring all holes in the block and head have a corresponding hole in the head gasket. If for some reason your head gasket does not have a cutout for any of the holes, verify that you have the correct part to ensure that you don’t inadvertently block a coolant or oil passage before continuing. Step 8 – Place the cylinder head on top of the gasket. Slip the head bolts through the cylinder head and use your fingers to tighten each bolt until the bolt head touches the cylinder head surface. Once are all in place, you can use a calibrated torque wrench to secure each fastener in the correct sequence (which is defined by the vehicle manufacturer). Your service manual should indicate the correct tightening sequence to use. Also note that some manufacturers require a staged tightening approach where you torque all bolts to a lower torque and then re-torque all bolts at the final torque to avoid any possible warpage. Finally, it is extremely important that you verify that your torque wrench is correctly calibrated prior to tightening head bolts. Usually torque wrench manufacturers offer this service, as well as some independent machine shops and similar. Due to the potential error in torque values for a torque wrench that has not had a recent calibration, failing to ensure correct calibration can put you at risk of undertightening or overtightening your head bolts which can lead to significant engine damage. Step 9 – Once the cylinder head is secured properly, it’s time to reinstall all other components that were removed. This includes the timing components, engine covers, engine accessories, intake components, and any other remaining parts. The installation order is generally the reverse of that in which they were removed. Step 10 – Refill your engine with oil and coolant. We recommend replacing your oil filter at this time since you’ve already done all the other work associated with an oil change. You’ll also want to make sure that your cooling system is bled of any air bubbles. Step 11 – Once everything is back together, fluids are in, and everything is back to normal, you should be ready to go. Prior to starting your car, we always recommend turning the engine by hand any time that you remove timing components to make sure there is no piston to valve contact resulting from incorrect installation. Once you are sure everything is right, start your car and let it idle. Inspect for leaks and otherwise ensure that everything is in order once more. After any major project, we recommend driving gently for the first few miles. A head gasket is an extremely critical component within your engine, and considering how much work it takes to replace it, you want to make sure you select a high quality gasket that won’t fail on you any time soon. The absolute worst thing that could happen is you put a faulty part in and through no fault of your own find yourself having to repeat the project. As there are many head gasket manufacturers out there, we wanted to share a few that have served us well in the past in hopes that we can make your search a little bit quicker. Felpro is one of the most well known names when it comes to supplying head gaskets for vehicles. They offer great gaskets for the vast majority of vehicles on the road today and come highly recommended for their quality. They offer complete replacement kits that will include all the accessory, intake, etc gaskets that you will have to replace as part of the job. They also sell gaskets individually if you prefer as well. Overall, Felpro is usually our first choice when it comes to replacement head gaskets. Click here to find a Felpro head gasket for your vehicle. Apex offers a variety of options for head gasket replacements. In addition to offering head gaskets individually, they also offer complete gasket kits in similar fashion to Felpro. Apex also offers head bolts and other related parts which can make your parts gathering effort before the project a little more convenient. Overall they make quality parts that will last and as such, we think that you will be satisfied if you decide to use them. Click here to find an Apex head gasket for your vehicle. Like the brands mentioned above, Victor-Reinz offers complete gasket kits for your vehicle in addition to individual head gaskets and head bolts. Their price is usually attractive and their quality is well respected. 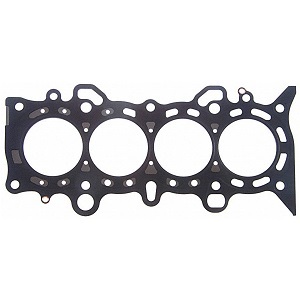 They make head gaskets for a wide variety of vehicles and they are relatively easy to find. Overall, if you opt to go with a Victor-Reinz head gasket, we are confident that the part you buy will treat you well for many miles to come. Click here to find a Victor-Reinz head gasket for your vehicle.